From Lillie's Q: "There's deep roots in the sauce you're holding. 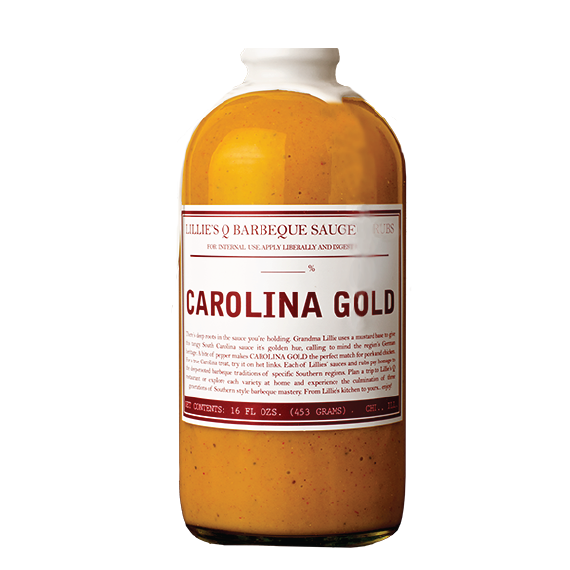 Grandma Lillie uses a mustard base to give this tangy South Carolina sauce its golden hue, calling to mind the region's German heritage. A bite of pepper makes CAROLINA GOLD the perfect match for pork and chicken. For a true Carolina treat, try it on hot links." We currently offer Ground, 2-Day, and Overnight shipping, within the continental United States. We ship Monday through Friday via FedEx. Shipping charges are calculated per ship-to address and are based on the total cost of your order. See our Shipping Info page for rates. © 2019 Wm. A. Straub Inc.